Tamani looked at her gravely, and reached up to tuck her hair behind her ear. He hesitated for an instant, then his hands found the sides of her face, pulling her to him. He didn’t kiss her, just held her face close to his, their foreheads resting together, their noses almost touching. She hated how much it felt like good-bye. Laurel now knows the truth: Yuki is a rare Winter faerie, the most powerful—and deadly—of all, and Klea plans to use her to help conquer and destroy Avalon. But Klea’s reach extends far beyond one wild Winter faerie. With Tamani, David, and Chelsea by her side, Laurel prepares to face what may be Avalon’s final days, in the stunning conclusion to the Wings series. An explosive end to what has become one of my favorite faerie series. I barely even know where to start, so while I’m thinking about that, let’s talk covers for this series. 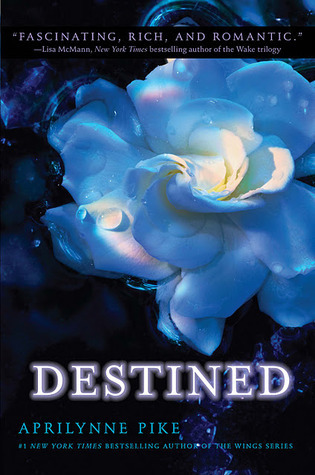 I’d have to say my favorites are the cover for Wings, and the cover for this book, Destined. Spells and Illusions just had too much going on, but these two each had a single thing, so it works. Destined is my favorite overall. This book was like a movie in my mind. Most of the time when I’m reading I can imagine in my mind what I’m reading, but it doesn’t always have that feeling of a movie. But this one does, because I think Destined is the best example of Aprilynne Pike’s writing. I can even recall specific events that had they been real would be devastating and haunting, what happened at the Academy. Another thing amazed me was how the battle felt drawn out and yet at the same time didn’t, and I know that doesn’t really make any sense. I don’t know how to explain it, but whatever it was it worked. Klea is one of those characters that is truly evil, even though she didn’t start out that way before we met her. I felt bad for what had happened to her before we met her, but not about what happens after. Everyone rose to the occasion for this final confrontation though. While Chelsea and David are both just in high school, they did a lot of growing up in Destined. I was proud of both them and what they were able to do to help Avalon. We do see some friends go, and it is sad. This book has made me choke up a couple of times. Like Claudia Gray’s blurb on the front cover says this is “The perfect ending.” I am for the most part satisfied by this ending, though it is also bittersweet. There is a letter at the end though that had my heart hurting for it’s author. I won’t say who wrote or who it was written to, but I do warn to you be careful in deciding to read it. In the end this is a must read series, especially if you love faeries. Review: Eden by Keary Taylor & Signed Book Giveaway! SO glad that you enjoyed this series! I have been wanting to read it for a while now. I may have to bump it up on my list! 🙂 Great review!